The mainstream media is all over the latest study on aspirin and heart disease--like ants on a picnic spread. Deep sigh. The study, published in the Lancet came to two conclusions: 1 One of which is worth a, "What took you so long?" The other elicits more of a, "Are you out of your freaking mind?" So, what are these two "mind-blowing conclusions?" In patients receiving aspirin-based antiplatelet treatment without routine proton pump inhibitor (Nexium, Prevacid, etc.) use, the long-term risk of major bleeding is higher and more sustained in older patients, with a substantial risk of disabling or fatal upper gastrointestinal bleeding. Given that half of the major bleeds in patients aged 75 years or older were upper gastrointestinal, co-prescription with PPIs to prevent such bleeding should be encouraged. Amusingly, the more lay oriented media almost universally latched onto the first point. Whereas the medical media, saw fit to lead with the second. Isn't bias a wonderful thing? Anyway, let's take a closer look at the study in question to see how we arrived at those two conclusions. And then we'll explore why I'm less than sanguine about either one of them. Previous studies have estimated that between 40 and 60 percent of people over 75 in Europe and the U.S. take aspirin daily to prevent heart attacks. That's a lot. It represents, in America alone, some 48.7 million adults who report being on low-dose or baby aspirin.7 While experts have known for a number of years that daily aspirin carries a risk of internal bleeding--in particular, upper gastrointestinal bleeding8--the risk was assumed to be small enough that the U.S. Preventive Services Task Force felt the heart and colon cancer protective benefits outweighed any risk from bleeding.9 (Note: recommendations made by the USPSTF are independent of the U.S. government.) But the implications of long-term use in older people have remained unclear because most clinical trials involved patients under 75. The study just published in The Lancet, however, which examined a total of 3,166 Britons who had suffered a heart attack or stroke and were taking blood-thinning medication over a 10-year period to prevent a recurrence, was split equally between patients both older and younger than 75. And the results were eye opening. The risk of disabling or fatal bleeding from taking low-dose aspirin jumps sharply with age. In summary, as Peter Rothwell further explained, "In people under 75, the benefits of taking aspirin for secondary prevention after a heart attack or stroke clearly outweigh the relatively small risk of bleeding. These people needn't worry…In the over-75s the risk of a serious bleed is higher, but the key point is that this risk is substantially preventable by taking proton pump inhibitors alongside aspirin." As I pointed out in 2012, when it comes to the use of low-dose, daily aspirin to prevent heart attacks and cancer, there are many dissenters within the medical community. And while it is true that millions of people still take aspirin every day to lower their heart attack and stroke risk (thank you very much television advertising), not to mention a whole new crop who may yet be reached through marketing campaigns and convinced to do so to "prevent cancer," persistent, contrary research is starting to change some of that thinking. And a major study published in the Journal of the American Medical Association at that time only added to the drumbeat. According to the results involving 186,425 people using low-dose aspirin and a matching control group of 186,425 that did not, aspirin use was "significantly" associated with an increased risk of major gastrointestinal AND cerebral bleeding episodes.14 The risk for serious bleeds was a stunning five times higher than had previously been reported in clinical trials of daily, low-dose aspirin regimens. Now, to be fair, according to previous studies, low-dose aspirin lowers your risk of having a heart attack by 60 percent.15 That's impressive! Unfortunately, as Mark Twain once said, "Facts are stubborn things, but statistics are pliable." As it turns out, aspirin's proclivities when it comes to heart disease are like those seen with statin drugs. That is to say: yes, they reduce your risk of having a "second" heart attack or stroke, but that doesn't mean what you think it means. First, when it comes to the treatment's usefulness for preventing a first heart attack or stroke, the benefits seem to vanish. It only has benefit in preventing a second heart attack, not a first. And more importantly, as also seen with statin drugs, although aspirin reduces your risk of having a "second" event, it does not necessarily decrease your risk of dying -- not even one single percent. And isn't that really what you're trying to prevent? In fact, it was this very same study--the one that showed that low-dose aspirin lowers your risk of a second heart attack by 60%--that also found that there is no significant association between using or not using low-dose aspirin and the risk of death from coronary heart disease. Ouch! The bottom line is that the minimal benefits of low-dose aspirin and the high risk of bleeds have been known for years. The fact that aspirin more negatively affects the elderly, who are more likely to have compromised endothelial tissue in their intestinal tracts, should hardly be a surprise. As doctor John Cooke, chairman of cardiovascular sciences at the Houston Methodist Research Institute and a leading researcher on PPIs said, healthy young endothelium is "like the Teflon coating of the blood vessels. It prevents things from sticking." But as we age and our endothelium becomes damaged, it behaves more like Velcro, and things start to stick. That's how blood clots can begin to form and cause problems like heart attacks and strokes. Which brings us to the stunning recommendation from the latest study: if you're over 75, you should absolutely be taking daily low-dose aspirin AND be taking a proton pump inhibitor along with it. Are They Out of Their Freaking Minds? There's at least a baker's dozen reasons why taking PPIs along with your aspirin is a horrible, horrible idea. The connection between PPIs and compromised endothelial tissue was established in a 2013 study led by Dr. Cooke that found that PPIs really do harm endothelial function--throughout the body.16 In other words, we're not talking just about endothelial tissue in the intestinal tract that can lead to bleeding, but also the endothelial tissue that lines the arterial walls. In other words, the use of PPIs can lead to an increased risk of developing coronary artery disease. And in 2015, that connection was more clearly established when a study, again led by Dr. Cooke, analyzed data from 2.9 million patients and found that people who used PPIs such as Nexium and Prevacid were 16% more likely to have a heart attack.17 And that risk increased to 25% if people started taking PPIs before age 55. Low stomach acid, which is the desired result of using PPIs, is associated with poor digestion. Not only is there insufficient stomach acid to break down food, there is insufficient acidity to optimize the digestive enzyme pepsin, which requires a pH of around 2.0. This results in partial digestion of food, leading to gas, bloating, belching, diarrhea/constipation, autoimmune disorders, skin diseases, rheumatoid arthritis, and a host of intestinal disorders such as Crohn's and IBS. An increased risk of Barrett's esophagus.25 That's right. Instead of helping prevent Barrett's esophagus, one of the prime reasons for using PPIs in the first place, PPIs may actually promote it. A control study in Denmark showed that chronic long-term use of PPIs was associated with a significant increase in the risk of developing esophageal cancer in patients with Barrett's esophagus.26 No cancer-protective effects from PPI's were seen. In fact, high-adherence and long-term use of PPIs were associated with a significantly increased risk of adenocarcinoma or high-grade dysplasia. The same study found an increased risk of stomach cancer among PPI users. For years, there has been debate about whether or not PPIs are associated with an increased risk of dementia. A 2016 study published in Jama Neurology, however, confirmed the association.28 As the study concluded, "The avoidance of PPI medication may prevent the development of dementia." PPIs for controlling stomach acid are associated with a potential 25% increased risk of early death from any cause. So, there you go, as promised, a baker's dozen reasons why recommending the co-prescription of PPIs with daily aspirin to prevent bleeding is a really, really bad idea. And if a baker’s dozen is not enough, a new study published on July 3rd in the British Medical Journal Open found that, at prescription strength, proton-pump inhibitors are associated with a potential 25% increased risk of early death from any cause.29 In other words, if you take daily, low-dose aspirin (which won’t add a single day to your life expectancy30), you need to take prescription PPIs to prevent dying from gastrointestinal bleeding—but those PPIs, all by themselves, are going to increase your risk of dying early by 25%. As the British like to say, “Brilliant!” And by the way, in reporting this new study, no one in the mainstream media connected it to the study they just reported on telling people to use PPIs with low-dose aspirin. Again, brilliant! At this point, you might be asking yourself, "Yes, that's all well and good, but if I'm at risk of dying from a heart attack, what choice do I have if my doctor tells me I need to be on daily aspirin and take PPIs?" Well first, you might want to remember, as we just mentioned, that the evidence in peer reviewed journals strongly suggests that although daily dose aspirin may marginally reduce your risk of a second heart attack, it doesn't add one single day to the length of your life. And again, isn't that the reason you're considering taking low dose aspirin anyway? 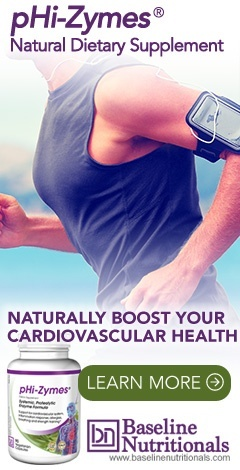 But more importantly, there is a safe, all-natural alternative to aspirin and PPIs that not only can protect you from heart disease and cancer like aspirin (and without the negative side effects) but can also, for most people, replace PPIs (again, without the negative side effects). We're talking about enzymes--systemic proteolytic enzymes to replace low-dose aspirin and digestive enzymes to eliminate the need for PPIs. Systemic proteolytic enzymes are designed to be taken without food. They are taken between meals so that they quickly enter the bloodstream, as opposed to being involved in the digestion of food. Once in the bloodstream, they can indeed reduce systemic inflammation, lessen pain, optimize the ability of blood cells to move independently, lower the risk of cell mutations, and help repair cardiovascular damage. At this point, I would recommend that, if this is a topic that interests you, click on the following link and either read the whole article, or just scroll down to the conclusion. You might also enjoy this link. And if you're dealing with acid reflux and are now concerned about using PPIs, then you might want to check out these three links which talk about how digestive enzymes, along with some other natural options, can obviate the need for PPIs. I would like to ask you to pay attention to the article "Discovery of plant extracts that greatly delay yeast chronological aging and have different effects on longevity-defining cellular processes", Oncotarget. 2016 Mar 29; 7(13): 16542–16566. The authors screened a library of Plant Extracts (PEs) for extracts that can increase yeast chronological lifespan (CLS). "6 of the 35 PEs from the library significantly increased both the mean and maximum CLS of yeast under non-CR conditions if added at final concentrations ranging from 0.04% to 1.0% (Figure S1–Figure S3). A group of these longevity-extending PEs included the following extracts: 1) 0.5% PE4 from Cimicifuga racemosa (Figure ​(Figure1A,1A, Figure 3A and 3B, Figure S1); 2) 0.5% PE5 from Valeriana officinalis L. (Figure ​(Figure1B,1B, Figure 3A and 3B, Figure S1); 3) 1.0% PE6 from Passiflora incarnata L. (Figure ​(Figure1C,1C, Figure 3A and 3B, Figure S1); 4) 0.3% PE8 from Ginkgo biloba (Figure ​(Figure1D,1D, Figure 3A and 3B, Figure S1); 5) 0.1% PE12 from Apium graveolens L. (Figure ​(Figure1E,1E, Figure 3A and 3B, Figure S2); and 6) 0.1% PE21 from Salix alba (Figure ​(Figure1F,1F, Figure 3A and 3B, Figure S3). None of the six lifespan-prolonging PEs affected growth rates in logarithmic (L) and post-diauxic (PD) phases or impacted the maximum cell density in stationary (ST) phase of yeast cultures under non-CR conditions on 2% glucose (Figure S6). Thus, the observed lifespan extension by each of these PEs is unlikely to be caused by its ability to decrease growth rate or to make yeast more resistant to toxic substances accumulated during culturing in the synthetic minimal YNB medium." Of course yeasts differ greatly to humans, but most longevity studies are done on yeasts since it is easier, faster, more economical and I suspect reliable to some degree. I would very much like to get a response from you.